I finally realized what Powys' work reminds me of: The British comedy The Vicar of Dibley, which is about the first female vicar of a small, conservative, rural English parish. As Powys writes in this novella: "Mr Martin saw that hate, lust and greed held up the world and that the waters of life flowed always through these three forces into the minds of men. One other thing Mr Martin had learnt - that love was possible" (p. 84). Another author I'm reminded of while reading this - the antithesis of Powys - is Joe Abercrombie, whose world too is held up by hate, lust and greed but where there is no love, and (as far as I can tell) no possibility of it. 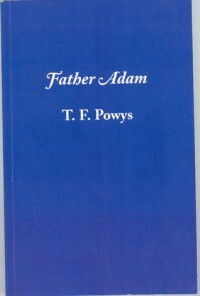 The best reason I can give for reading Father Adam (or any of the Powys I've read so far) is that you feel good during and afterwards. Powys' prose, characters and "cast of mind" are, respectively, brilliant, distinctive and hopeful without being polly-annish.